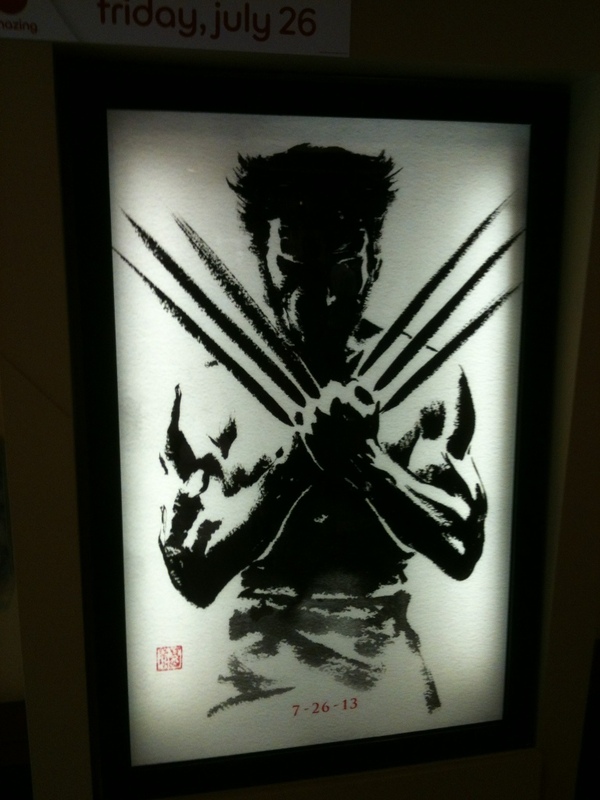 Poster at local AMC theater for The Wolverine. I really like the black and white contrast. Reminds me of Frank Miller artwork with Japanese influence. Ok, and I say this as a fan of X-Men (comic and 90’s cartoon), I’m a little sick of the Wolverine obsession. Yes, he IS actually one of the more interesting characters, but there ARE other story lines. I mean, Hollywood beat the crap out of the Phoenix saga, but then again, I’m not sure where they thought that would go anyway. Whatever. My point is, there are more characters in X-Men than Wolverine, and gosh, they could really explore that JUST a bit! H. Stern thank you for the comment. I would agree with Wolverine is been overkilled by Marvel over the years. Just think about how many teams in the comics he been in at the same time. However the reason i think the movies, comics, animation keep going back to the Wolverine well is his character was set up well (if you minus out the stupid origin) to adapt to as many stories as possible. I light to see a few other X-Men have their own movie but The Wolverine looks good and sounds like the X-Men: Days of Future Past will be good combining X-Men and X-Men:First Class actors. They may be too afraid to go with another character, they have put SO much stock into Wolverine that they probably feel they HAVE to play him out. Then they have the added bonus of hot guy.